Tumors of the thyroid gland are common and difficult to diagnose by palpation. 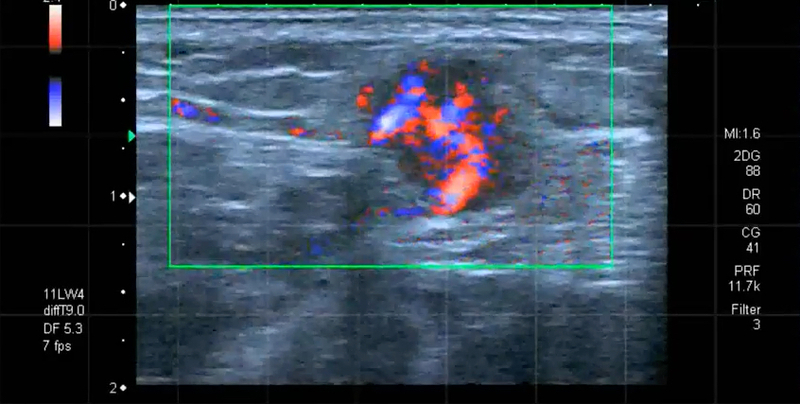 Sonography is the currently approved modality to find and follow suspicious nodules. Areas that have calcium deposits (visibility on sonogram means x-ray may be avoided) are most suspect and biopsy is often performed under ultrasound guidance. Additionally, parathyroid masses may be discovered that are a serious cause of bone loss in women and kidney stones in men. Spread to regional lymph nodes (gland) locally are detectable and can be accurately biopsied using the image guide on the probe. 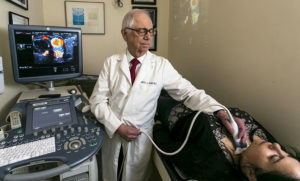 Low thyroid function may be measured by 3D Doppler analysis and treatment optimized by follow up with this non-radiation scanning technology.